On the eve of Tuesday night’s second presidential debate at Hofstra University, voters are divided as to which candidate they think will do the better job: 41% say Obama will do better, while 37% expect Romney to prevail. This stands in stark contrast to expectations prior to the first presidential debate two weeks ago, which voters expected Obama to win by a 51%-29% margin. The latest national survey by the Pew Research Center for the People & the Press, conducted Oct. 12-14, 2012, among 1,006 adults, including 857 registered voters, finds debate expectations for Romney have improved sharply among independents: Two weeks ago more independents thought Obama would win the first debate by a 44% to 28% margin. 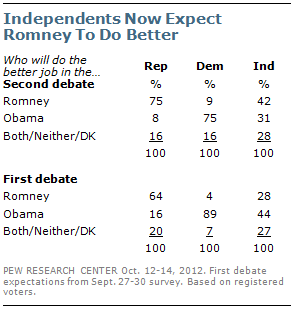 Today, more independents expect Romney to win the second debate, by a 42% to 31% margin. Expectations for Romney are also up among Republicans (from 64% expecting him to do better than Obama in the first debate to 75% now). 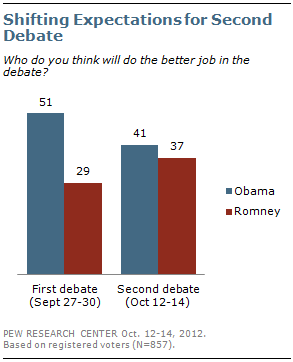 Few Democrats (9%) think Romney will do the better job in tomorrow’s debate, but they are less uniformly certain about how Obama will do. Two weeks ago, fully 89% of Democratic voters said they expected Obama to do the better job. That has slipped to 75% of Democrats going into the second debate, as the percentage who do not choose either candidate has about doubled (from 7% to 16%). Despite controversy over massive spending by outside groups in the 2012 race, relatively few voters think either candidate has been too personally critical of his opponent. Just 37% say that Romney has been too personally critical of Obama while a comparable percentage (35%) says Obama has been too personally critical of Romney. In June, more thought Romney was being too critical of Obama (43%) than thought Obama was being too critical of Romney (30%). Independents, in particular, have become less likely to say Romney has been too critical of Obama: Just 31% say this in the current survey, down from 42% in June. 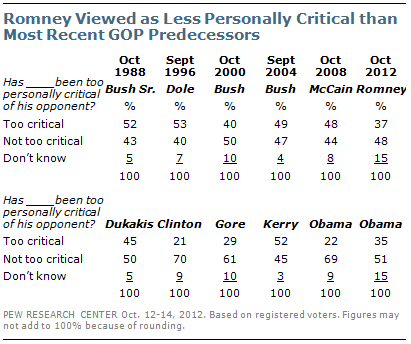 In October 2008, nearly half of voters (48%) said John McCain was too personally critical of Obama. And over five recent presidential election cycles, no Republican candidate has been viewed as less personally critical of their opponent than Romney is today. 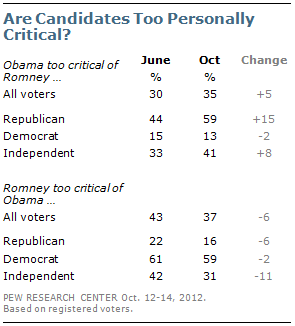 More voters say Obama is being too critical of Romney (35%) than said that about Obama’s campaign against McCain in 2008 (22%). In 2004, 52% of voters said John Kerry was being too critical of his opponent. In 1996, very few voters (21%) said Bill Clinton was too personally critical of Bob Dole in his re-election campaign. Six-in-ten voters say they watched at least a little of last Thursday night’s vice-presidential debate between Joe Biden and Paul Ryan at Centre College in Danville, KY. 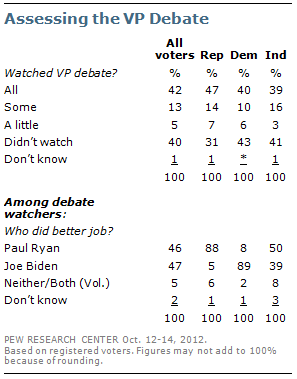 Among debate watchers, as many say Biden did the better job (47%) as say Ryan (46%). Before the debate, voters were similarly divided as to who they thought would do the better job with about as many saying Ryan (40%) as Biden (34%). For more see: “Biden Viewed Unfavorably, Divided Opinions about Ryan,” released Oct. 10, 2012. Republican voters overwhelmingly say Ryan did the better job in the debate (88%); a comparable percentage of Democrats (89%) say Biden did the better job. Among independents, 50% say Ryan did better, 39% say Biden.